The two WTP systems had two very well tempered progressions, that beat the entire Zumma tester books and generated profits for purchasers. They were both using a "march" type of progression, where bets increase or at times even decrease and one bets on the continuation of the series of the progression, win or lose the bets on the way, until one is ahead for the run or the session bankroll is exhausted. Well, there are other types of march progressions we can explore, one of them being the prime numbers. Prime numbers is the series of numbers that are divisible only by themselves and 1. For instance the number 11 or 23. There is no number that can divide those numbers, except themselves. The series of prime numbers forms a mild progression. They do not beat the entire Zumma tester books like the WTP series, but we can see a rising profit up until 5000 units, which is quite acceptable, provided we lock our profits at that point. As you can see, we also have opportunities to lock our profits at every increase of our bankroll by 1000 units. With 46 steps in total our highest bet becomes 199 units, but we never extend it that much. 191 units is the highest we will ever place. This requires a session bankroll of 580 units. The largest drawdown becomes 159 units. The application of the progression is quite simple. We simply bet as per the above progression table until we are ahead, where we reset to the beginning of the series, or if we lose the 580 unit session bankroll. According to the performance chart above, we see the session bankroll of 580 units being lost 10 times, but the system still generates 5000 units nevertheless, despite those abandoned runs. As per bet selection, we will simply bet on the Player side in Baccarat in order to avoid any commissions on Banker wins. Applying the series as a typical run at the very first few hands with 2,3,5,7,11,13,17,19,23,29,31, the run ends when we are at 28 units profit. Then we reset back to betting the initial 2 units of the series. 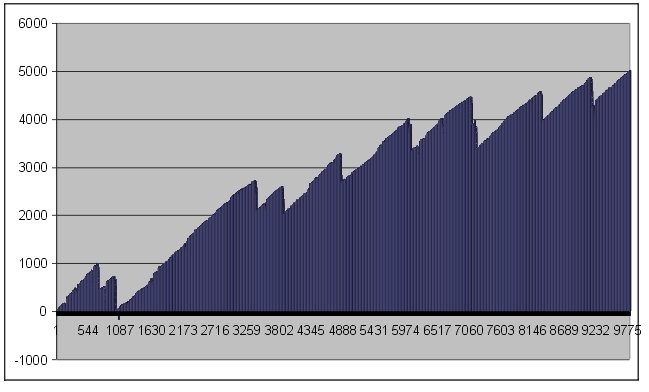 The Counter column shows the number of the progression steps with which we pursue our run. By the end of 2 shoes, we are at +151 units, which is quite phenomenal, unlike any grind system we may be acquainted with. Hope you enjoyed this free system.